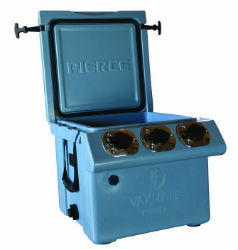 Rotomolded vaccine cooler, VaxMate, is manufactured by ranchers, for ranchers and vets. Keep your vaccines between 35.6 – 45 degrees Fahrenheit in the summer or winter. Programmable temperature gauge. Comes with a stainless steel instrument tray, stainless steel syringe holders with holder covers, carrying handles and vent plug. Drain plug can connect to a hose for quick hand washing. Sharps container available. Remember, if VaxMate saves one cow or calf by keeping your vaccines effective, it has more than paid for itself. If you are looking for new vet supplies, VaxMate is a great fit for your cattle chute operation. Just set your temperature gauge, pre-chill your cooler and fill with ice packs and go. digital side display, temperature alarm, durable construction, stainless steel syringe holders, leak proof, 5 day ice retention, food grade, corrosion resistant. Syringe Specs: 3 stainless steel holders, inside dimensions are 1.625", tube length 8.5"